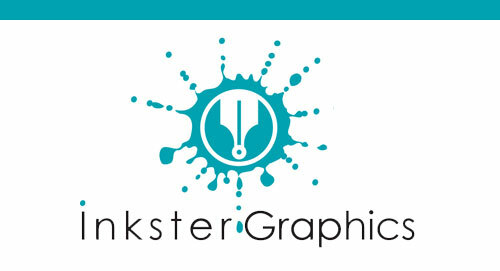 This image was created based a 4″ x 6″ black and white photo that was a reference. Right from the start, the intent was to re-create this 24″ 30″ image with a sepia-tone effect, using various shades of brown and black media. 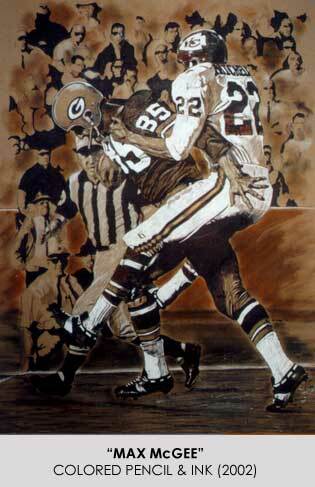 This image derives from Super Bowl I and features wide receiver, Max McGee. This image is literally a snap shot of the strength and conviction that he exuded throughout that championship game: 7 receptions / 138 yards / 2 TDs. 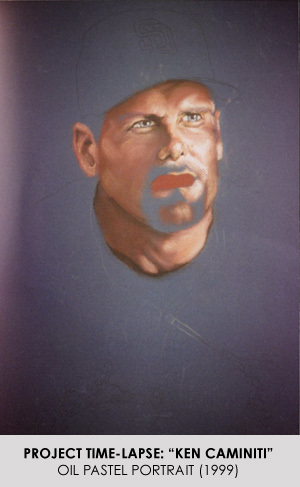 This 16″ x 20″ piece was done on Canson Paper, one of Nate Robb’s favorite substrates for colored pencils and oil pastels. 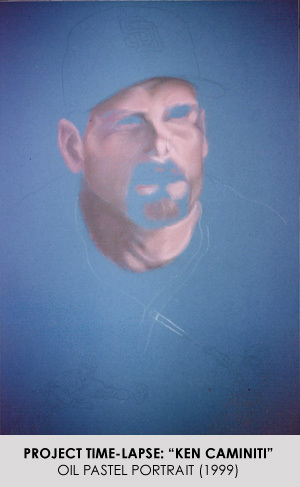 As you can see, he is a huge fan of delivering details, despite the soft tips of colored pencils. Those brittle tips often hinder the ability to add pinpoint touches in an accurate fashion. 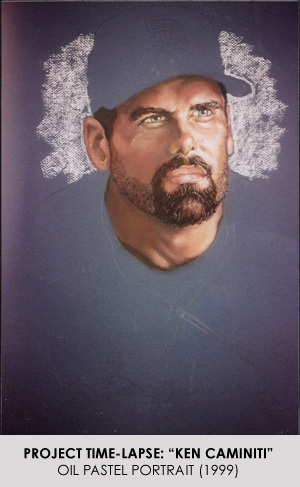 STAN HUMPHRIES & THE 1994 CHARGERS’ OFFENSIVE LINE. 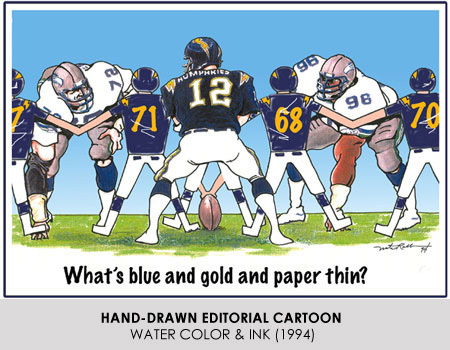 This cartoon was rendered to support an editorial that dealt with the limited time that Chargers QB Stan Humphries typically had in the pocket during the fist few weeks of the 1994 season. 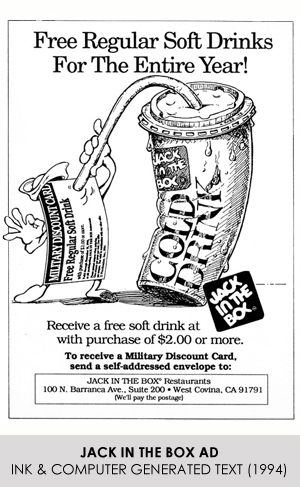 The Military Press Newspaper had been given the leeway to create a coupon for service members that would tie in with efforts by Jack In The Box to draw business from the military community. 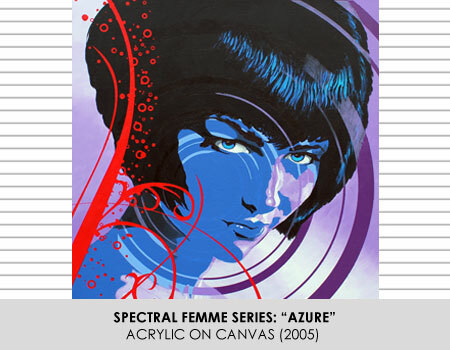 The piece needed to be simple and eye-catching. 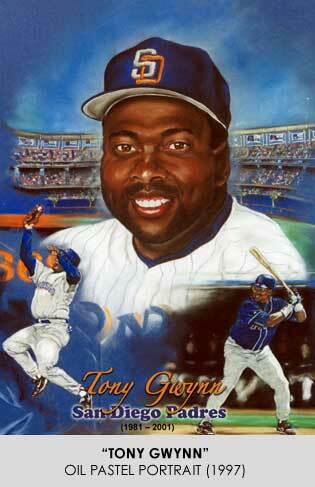 After some decision to that end, they decided to go with this friendly, hand-drawn, pen & ink. 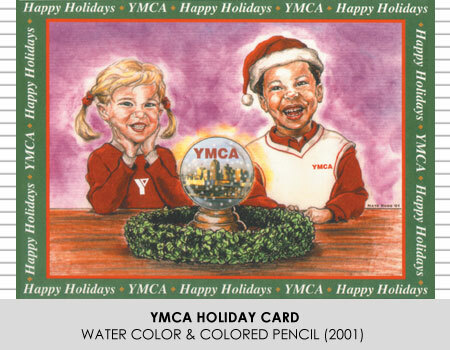 This holiday card was the product of direction received by a YMCA official who sought a happy, holiday scene, featuring laughing children and a snow globe that held San Diego’s skyline within it. 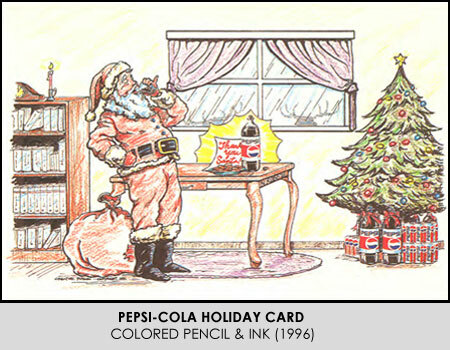 This old-time illustration was rendered by request of the Pepsi-Cola Bottling Plant of Southern, California. 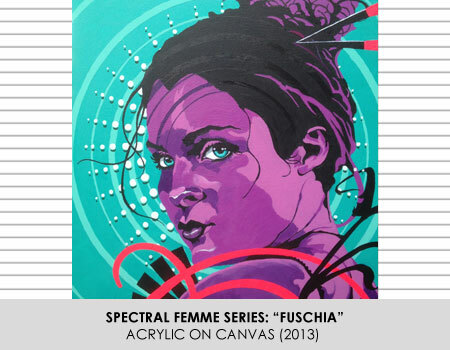 Click arrows to view gallery and enlarge images. 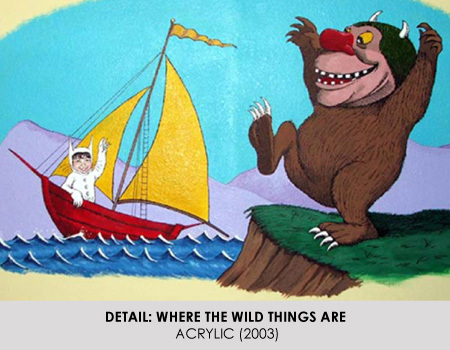 WHERE THE WILD THING ARE. 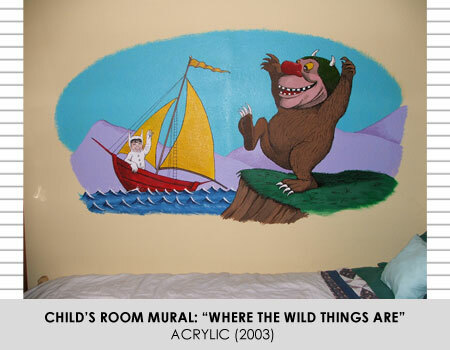 This acrylic painting was done on the bedroom wall of a 4-year old boy. The face of Max, the principal character in this story, was replaced with a caricature version of the afore-mentioned 4-year-old. 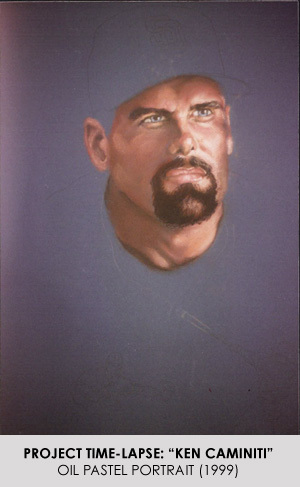 This piece was painted on a young girl’s bedroom wall. 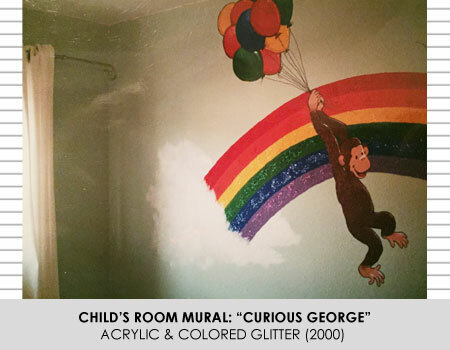 Given the fact that the room faced east, Inkster decided to include glitter in the paint that made up this rainbow. Long before the invention of the grocery store club card, hunters used shafts with replaceable Clovis spear points to put food on the table; or on the boulder fragment that served as a table. 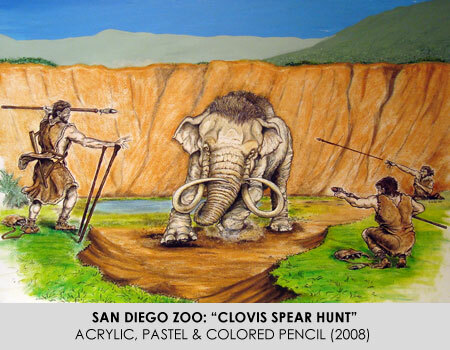 This 28” x 40” conceptual illustration, created with pastel, colored pencil and ink, was provided to a tar pit area display case at the San Diego Zoo. 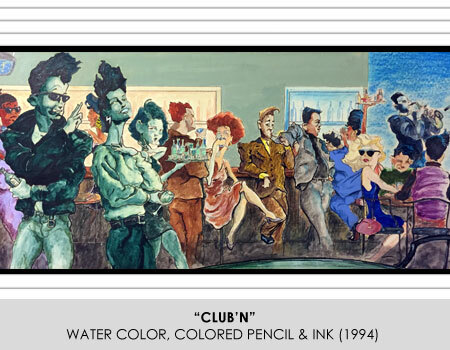 This watercolor piece was rendered within a three-hour span of time following a two-hour stay at a nightclub in Pacific Beach. 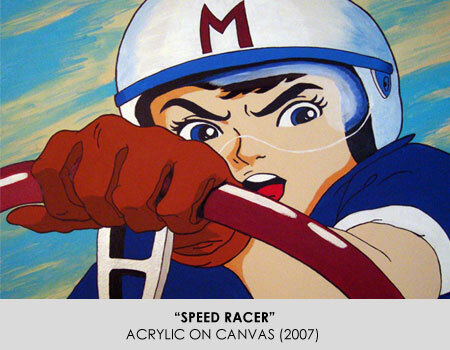 After seeing an episode of Speed Racer one day, a freeze frame shot was taken of Speed’s textbook expression during a spinout. 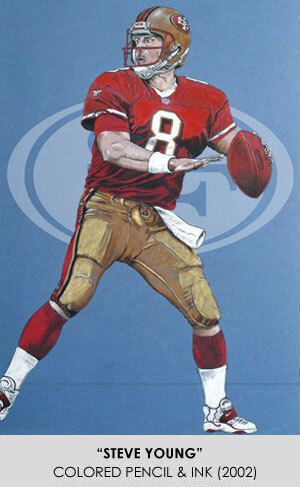 That shot was used as reference for this acrylic painting. If you have a veterinary bill that’s beyond your means to satisfy, a fund exists that can be accessed that allows you to receive funding that can be used toward that tab. Thanks to the efforts of FACE (The Foundation for Animal Care and Education), this type of funding is available. 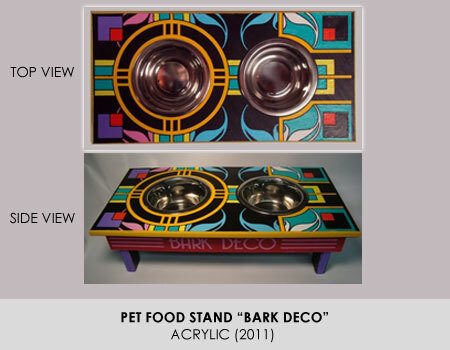 FACE provides unpainted wooden pet food stands to artists who have free range to augment them in ways that will attract funding via the auctions that FACE holds. 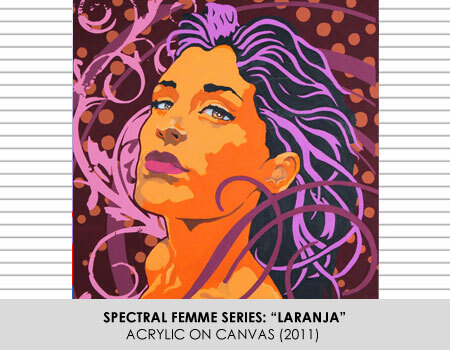 These are three of the 24” x 24” canvas paintings that feature a uniquely expressive woman, in colors that are equally unique, with touches of gloss paint incorporated from accent purposes. 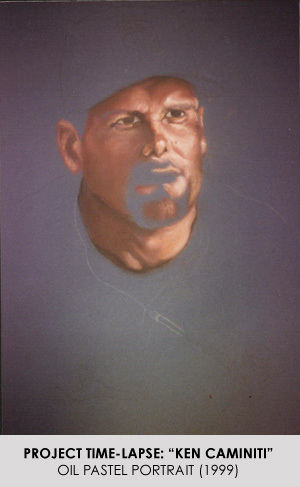 This was the first sports portrait, aka: “sportrait”, that was rendered by Inkster. 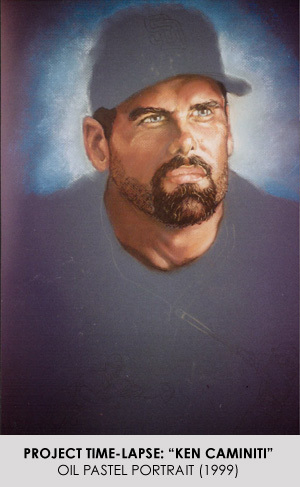 It was unique at the time to portraits because it not only features a life-sized head and shoulders view of the player, but it also showcases an offensive and a defensive full figured action image. This was set up with Qualcomm Stadium as a backdrop and boasts the flags of all of the members of the 3,000 Hit Club. 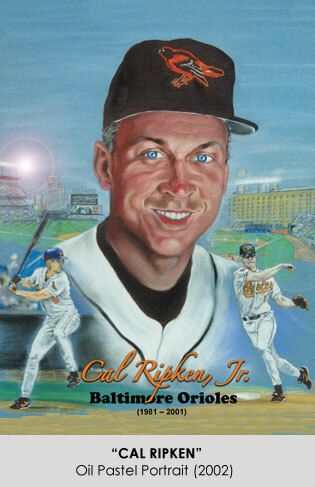 Set against the comfortable grounds of Camden Yards, this oil pastel piece of Cal Ripken was completed shortly after the conclusion of the Tony Gwynn art. 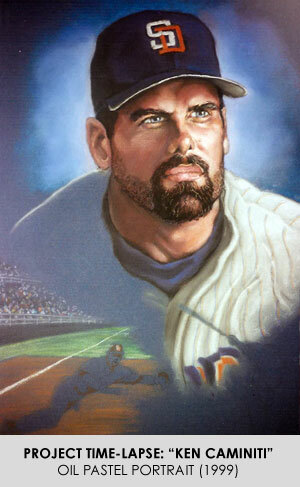 This is perhaps the best of the Padres player renderings. Hoffman’s signature delivery is on full display here, broken down into three separate sections. 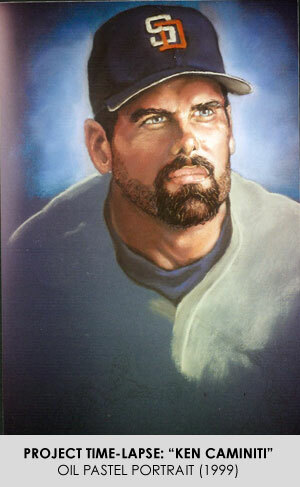 This was the second image of a Padre great that was captured in oil pastel, on Canson paper. 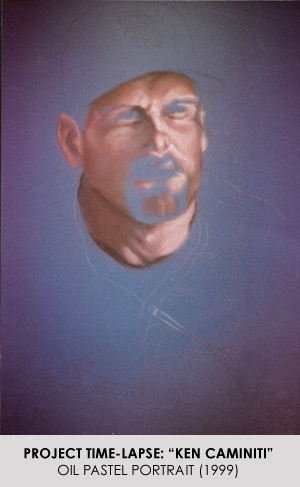 The time-lapse styled process is shown here in 14 steps in effort to show how something like this comes together. 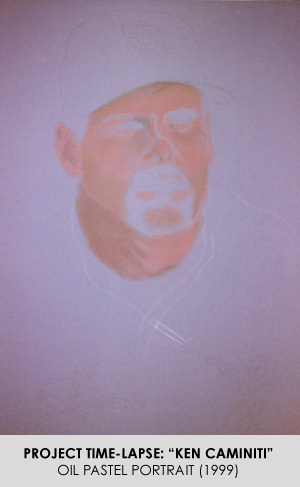 Indian Red pastel is laid down first, followed by lighter and lighter shades of color. 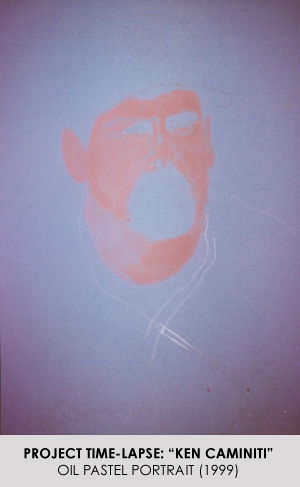 Each new color is blended into the colors that preceded them. 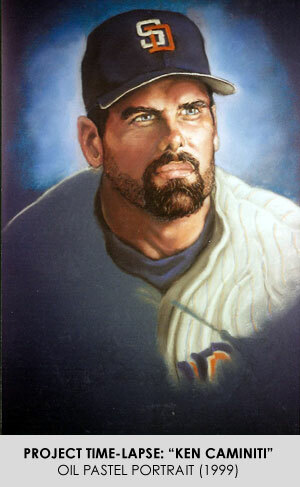 Ken was good enough to sign an original version of a portrait that was created of him and really seemed to be impressed with it. So about a year later, a second version was created expressly for him. 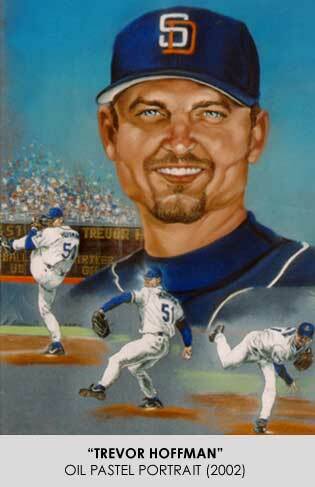 It was signed by numerous Padres fans during a tailgate period, and then routed to Ken who had rejoined the Houston Astros. 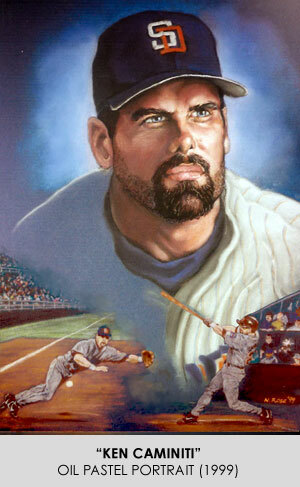 Word is that picture was hung in his game room. 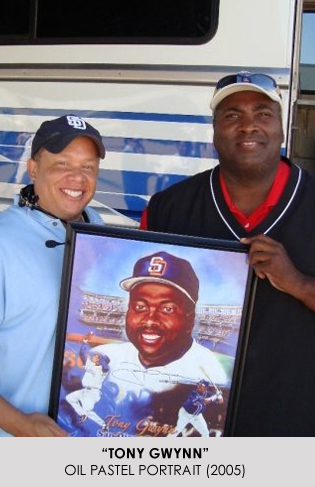 Tony Gwynn and Nate Robb pose with one of two prints that were made of this original work. 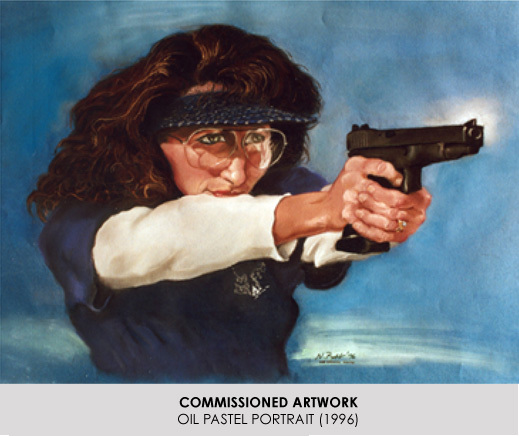 One of those prints were kept by Inkster, the other framed print was given to Mr. Gwynn as a way to thank him for signing a print. 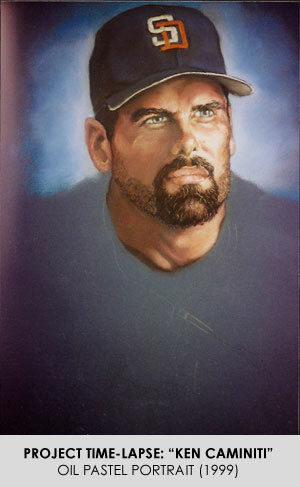 This 20″ x 24″ oil pastel portrait was commissioned for a client as a gift.